As in, totally safe for work. Made of stretchy soft Japanese twill, our Rubin Dress is perfectly tailored so it fits you just right. Plus, it has the right amount of coverage so it fits in with any office dress code too. Made in NYC. Flared, scoop neck dress tailored to skim the figure. Vertical seams create long lean lines. Hemline falls just above knee. Our model in black is 5’10 ½” and wearing a size 4. Our model in green is 5'10" and wearing a size 2. 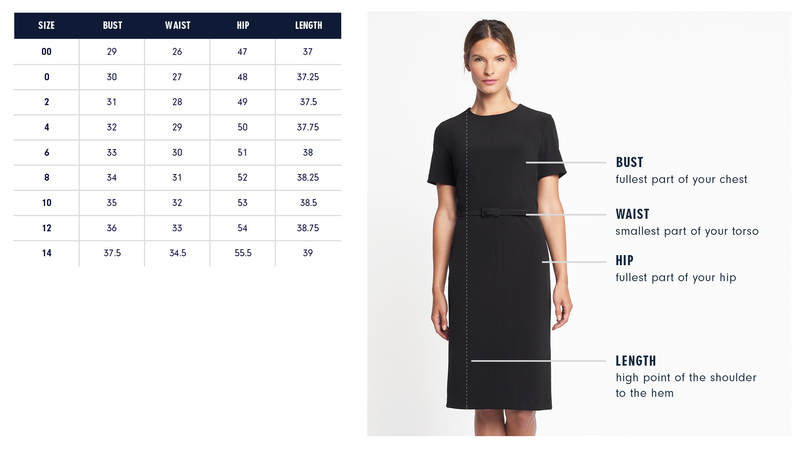 Exact measurements of the Rubin Dress below. All measurements are in inches. For general brand fit, sizing, and measurements, please visit our Brand Fit & Size Guide. Flared, scoop neck dress tailored to skim the figure. Vertical seams create long lean lines. Hemline falls just above knee. I wanted to create an easy-to-wear basic silhouette that would be flattering on every body. I utilized a number of long vertical seams to create a fit that hugs the figure without being tight. Features: Scoop neckline and contoured armholes for coverage and movement.